With its creamy sauce and crunchy topping, this dish will make spinach everyone's favourite vegetable. Mix first 4 ingredients in large bowl. Stir in 3/4 cup cheddar and 1/2 cup cracker crumbs. 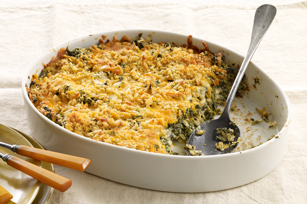 Spoon into 2-L casserole dish sprayed with cooking spray; top with remaining cracker crumbs and cheese. Bake 20 to 25 min. or until crumb topping is golden brown and cheese is melted. Thaw frozen spinach in refrigerator overnight. Or, place unwrapped package of spinach in microwaveable bowl; thaw in microwave as directed on package. Squeeze thawed spinach well to remove as much water as possible.